Wow! This is quite the 90's time capsule! 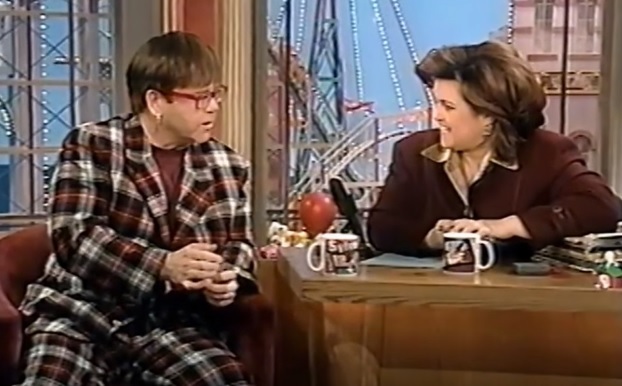 Rock icon (and all around witty diva) Elton John was a guest on the Emmy award-winning The Rosie O'Donnell Show and the two gossip about such stars as: Tom Cruise, Barbra Streisand and Michael Jackson! Also, Elton John shares with Rosie the origin story behind his classic song, "Daniel." Many people have wondered if "Daniel" was a love song about two men. Watch the video to find out more, enjoy! Be sure to check out the second video of Elton John's live performance of "Daniel" (with lyrics) which was filmed at Wembley Stadium during his 1984 Breaking Hearts Tour.